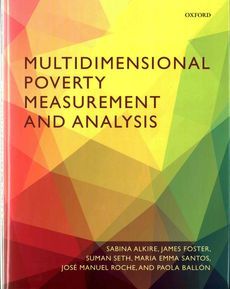 Multidimensional Poverty Measurement and Analysis, published by Oxford University Press in 2015, provides an in-depth account of multidimensional poverty comparison methodologies, with a particular focus on the Alkire-Foster method. The book has four parts: 1) The first part introduces the framework for multidimensional measurement and provides an overview of a range of multidimensional techniques and the problems each can address. 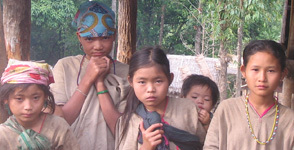 2) The second gives a synthetic introduction of ‘counting’ approaches to multidimensional poverty measurement and provides an in-depth account of the counting multidimensional poverty measurement methodology developed by Alkire and Foster. 3) The penultimate part deals with the pre-estimation issues such as normative choices and distinctive empirical techniques used in measure design. 4) The final part deals with the post-estimation issues, such as robustness tests, statistical inferences, comparisons over time, assessments of inequality among the poor and some regression techniques. The chapters of this book can be read here. The related video clips can be viewed here. They are also published as OPHI Working Papers 82 – 91 (open access); and the full book can be bought at Oxford University Press website.